April Kennedy...My Life + My Style: THIS IS WHAT IT IS ALL ABOUT. As I stood at the kitchen sink doing dishes last night and listened to Dave read Blake a story down the hall, I thought to myself, "This is what it is all about!" Me....my life. Dishes, laundry, picking up, more dishes, making beds, laundry, boo boo kisses, tight hugs. Essentially serving my family. Being a MOM. And I thought....."How lucky I am. 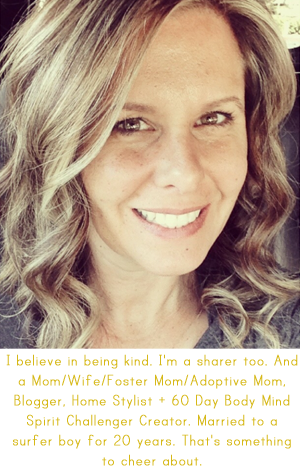 I am a MOM." I have to say, there is much enjoyment for me when doing the dishes (not so much unloading the dishwasher....it is my least favorite job). It is a time that I reflect. Reflect on my role in our family. And relish every part of that role. I truly love my responsibilities that come with being a mom and wife. Nie Nie taught me to love that roll and now I still often think of her and how she cherished each moment she was able to serve her family and how she looks forward to serving them again. And my own mother was an amazing example to me in happily serving her family. If I wasn't harassed as much as I am about not making my husband lunch by her, I might have seen it earlier! While growing up we were woken with a cheerful "Good morning, sunshine." We had a hot breakfast most mornings and lunches were packed for all of us with a little handwritten note on our napkin folded neatly inside our brown paper bag with our name written on the outside. My mom listened to music and sang while she worked around the house. I need to turn on music more often. I have wonderful memories of work interrupted with my sister, mother and me running to the silverware drawer, grabbing a spoon and returning to a spot on the fireplace hearth to sing, with "microphone" in hand at the top of our lungs. After a few songs, Mom would remind us "back to work, girls"! What wonderful memories. As I stand at the kitchen sink doing dishes I also wonder if the memories I am creating for my children will be good. If the good will outweigh the criticism that I sometimes let slip out in frustration. If, I as a mother, am doing enough for my children. Do I put them off for too long over unnecessary distractions. Am I strict enough with them about enforcing manners, respect for adults and good study habits. Am I kind enough, gentle enough, sensitive enough? But even with all these doubts, I still know enough about myself and that I am doing some good to be able to enjoy this role as mother. This is what it is all about. And I want to make it count! Thank you sweet April. And your last paragraph ~ that's what I wondered too. But look at what you remember about me...that's the same things your children will remember about you. But we had a great time, didn't we? It is such a wonderful thing to slow down every so often and just breathe and relish the joy of being a mom, and appreciate the breathtaking blessing that it is. Tonight, we will turn on the music and sing. And dance. Wee One loves to dance. His face lights up with music in on. I can't wait for tonight. Thank you for the inspiration. Happy Friday. Every mother wonders the same exact thing!! I, too, have been trying to enjoy my role as Mom and homemaker more. Thanks for the reminder that THIS is what it is all about. can you come do my dishes. last night after tucking the kids into bed I returned to the kitchen to ponder. My thoughts went like this..."I have spent at the very least an hour and a half cleaning this kitchen today and right now it is a mess. I just can't wash one more dish or wipe one more counter. This kitchen is running my life." So instead of washing dishes I took a hot bath and enjoyed the night with Daniel. The dishes can wait. Glad you went and took a bath and spent time with Dan....that is equally important! Instead of messing up this comment with tons of words and such, I just wanted to say this: I cried... in a good way. I love this post. Thank-you! P.S. I also loved getting notes on napkins from my Mom.